Bell Aircraft Corporation's X-1E is loaded under the Boeing B-29 mothership in 1955. 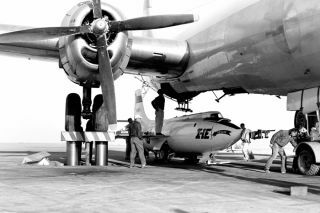 In this historical photo from the U.S. space agency, the Bell Aircraft Corporation X-1E airplane is loaded under the mothership, Boeing B-29. The X-planes had originally been lowered into a loading pit and the launch aircraft towed over the pit, where the rocket plane was hoisted by belly straps into the bomb bay. By the early 1950s a hydraulic lift had been installed on the ramp at the NACA High-Speed Flight Station to elevate the launch aircraft and then lower it over the rocket plane for mating.